For the town in Ribadesella, Spain, see Junco (Ribadesella). "Junco" is also a shrub in the genus Adolphia and the Spanish term for rushes (genus Juncus). Dark-eyed junco (Junco hyemalis hyemalis) female, Cap Tourmente National Wildlife Area, Quebec, Canada. 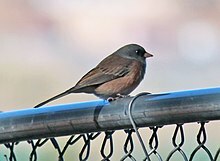 A junco /ˈdʒʌŋkoʊ/, genus Junco, is a small North American bird. Junco systematics are still confusing after decades of research, with various authors accepting between three and twelve species. Despite having a name that appears to derive from the Spanish term for the plant genus Juncus (rushes), these birds are seldom found among rush plants, as these prefer wet ground, while juncos like dry soil. Their breeding habitat is coniferous or mixed forest areas throughout North America, ranging from subarctic taiga to high-altitude mountain forests in Mexico and Central America south to Panama. Northern birds usually migrate farther south; southern populations are permanent residents or altitudinal migrants, moving only a short distance downslope to avoid severe winter weather in the mountains. These birds forage on the ground. In winter, they often forage in flocks. They eat mainly insects and seeds. They usually nest in a well-hidden location on the ground or low in a shrub or tree.